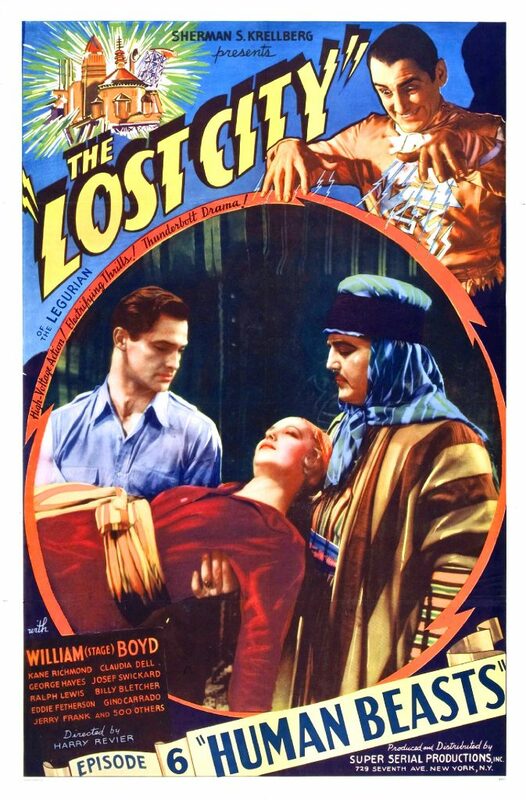 The Lost City is an independently made science fiction film serial created and produced in 1935 by Sherman S. Krellberg and directed by Harry Revier. Scientist Bruce Gordon comes to a secluded area in Africa after realizing that a series of electrically induced natural disasters had been detected in the area. There he finds Zolok, last of the Lemurians, in a secret complex under a mountain. Zolok had created the natural disasters as a prelude to his attempt to take over the world, holding a brilliant scientist, Dr. Manyus, there hostage with his daughter. He had also forced Manyus to create mindless “giant” slaves out of the natives as a private army and as the serial progresses we learn Manyus also turned another tribe, the spider-worshipping Wangas, into white burly haired midgets. The heroes escape Zolock, encounter the slave trading Queen Rama, and survive many harrowing adventures before returning to the Lost City and stopping Zolok’s plan. The film took the premise of that year’s The Phantom Empire but transferred the lost civilization motif from the west to another popular serial locale, the African jungle.